The meadow outside Bethel, New York, is eerily empty and silent. Yesterday it held half a million cheering people, and only a few hours ago, the closer, Jimi Hendrix, recast the "Star Spangled Banner" as a firefight in the Mekong Delta. Mark Berger's been here the whole time. Arriving four days early, he helped set up kitchens and paths. During the festival, he worked to calm kids tripping out on bad acid, maneuvered a water truck through a sea of spectators, and fell in love, twice. Woodstock was the sixties condensed into seventy-two hours, and proof that peace and love could turn a potential disaster into a mythic celebration of life. Now, it's decision time: Does he drop out and move to a commune in New Mexico or return to Brooklyn and become a teacher? 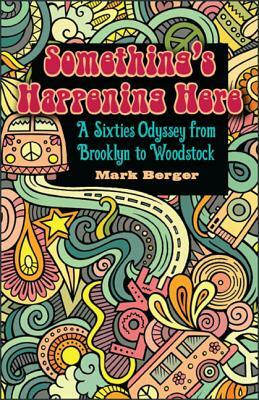 Something's Happening Here begins in Brooklyn eight years earlier, in 1961, where Berger, determined to be true to himself, pledges to live his life boldly. With buddies like Zooby, Bird, and Spider, he experiences the thrilling fear of joy rides and the roller coaster of mind-altering drugs. He's swept up in the energy of revolutionary writers and musicians and connects with the counterculture's spirit. Scenes abound, from catching the Coasters at a Brooklyn R&B club to digging Allen Ginsberg reading his poetry in a Tennessee steak house to having only a second to talk his way out of being sent to Vietnam. At Woodstock it all comes together--who he is, what he believes, and which path he has to take. Berger's vivid storytelling brings the moments to life with an immediacy that show you why something's happening here.